I am always in a pinch. I am not sure why I have this talent, but rising of bread usually occurs while we are already chompin' away at other bread.....we just can't wait. Preheat your oven to 450F. Put a dutch oven or other covered baking dish in to heat up. Make sure it is greased. 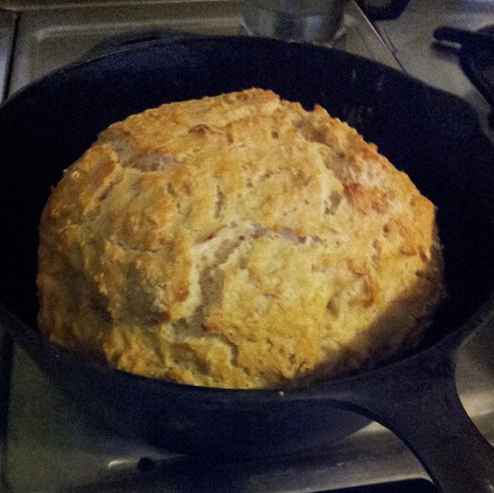 I use a cast iron dutch oven that is well seasoned. *Baking Soda and salt can make this very salty if you use too much. If you get baking soda streaks in your bread, sift the dry ingredients to ensure they mix well! Add milk or kefir and stir. Do not stir with machine. You don't want to overmix, but stir until the flour forms a wettish ball. Spelt flour is funny, sometimes I need more liquid than the recipe calls for, sometimes I don't!